The “victim” of this week’s news, Angelina who had been threatened by Harriet Hodkin and Mary Redfern appeared in the courts, yet again as the victim. It seems Angelina did attract trouble. The case was heard at Eckington Petty Sessions on Monday 5th December 1887. This time Angelina had been attacked by a married woman named Hannah Maxfield. Angelina lived at Barlborough Common and on the 13th October she stated that Hannah had followed her into her home and struck her several times, knocking her into a dresser. Witnesses were called and all said that they had heard Hannah threaten Angelina and saw her strike her several times. In her defence Hannah said that Angelina was always causing rows and no one could pass her house without being insulted. Hannah argued that Angelina had hit her first. The Bench decided that Hannah be bound over to keep the peace for 6 months and pay the court costs. Hannah Maxfield was no angel, in December 1892 she is again summoned to appear at Eckington Petty Sessions; this time for using threatening language to Jos Standell of Barber’s Row, Barlborough. Jos was the brother of Hannah and he stated that on 13th November Hannah had visited his home and threatened to “scald his eyes out”. Jos went on to describe how Hannah had frequently threatened him, but he had never threatened her. The argument was over a son of Hannah throwing stones at a pig. Hannah had asked her son to go and fight with Jos, but the son had refused. Two witnesses were called, Maggie Davis of Barber’s Row and Mary Wainwright both said they saw Jos Standell chasing the boy and heard Hannah shout “it’s the not the boy you want to get at its me”. The case was dismissed. So, what was Angelina’s story? Well she was born in Staveley in either the end of 1868 / beginning of 1869. She was part of a large family and her parents were George and Jane Rodgers. In 1871 she was living with her family in Rodgers Terrace, Staveley. Her father George is employed as a coal miner. By 1881 the family have moved to the near-by village of Barlborough. George is still working as a coal miner but also runs the Prince of Wales Public House on Barbers Row. Angelina is now 12 years old and one of 8 children still living at home. Angelina married John Taylor the coal miner in 1885, which would have made her a young bride at only 16 years of age. Her first appearance in the newspaper when Mary Redfern and Harriett Hodkin threatened her was only 2 years later. Angelina and John had 9 children, 6 were still living in 1911, 3 had died. In 1891 Angelina, John and their children are living at 49 Barbers Row, next door to Mary Redfern and her family, whose children were around the same age as Angelina’s. We can only wonder how day to day life was, did they fight or were they now resigned to each other’s faults? We will never know. They remained in the house for many years, but by 1911 they are living at Westfield, Barlborough. Angelina lived to the age of 77 years old, she died in 1946. S Hadfield first advertised his wonderful tomato sausage in June of 1886. He brags that they can only be purchased from his butchers. Samuel Hadfield was the son of Joseph and Priscilla Hadfield. He was christened on 12th February 1841 at Winster. The family were middle class and Joseph worked as a publican / farmer. In 1861 Joseph ran the Plough Inn at Brackenfield, Derbyshire and he farmed 64 acres. Samuel pursued his career from an early age; at only 20 years of age he is described as a Master pork butcher, showing that he had undertaken an apprenticeship in the art of pork butchery. As apprenticeships were usually for a term of 7 years then Samuel would have been around 13 years of age when he began his trade. Life as a shop keeper in the 19th century would be no easy task, there were always those who would steal from you and Samuel found this out in 1861 when Sarah Ann Houghton stole 2 pies from his establishment. The case was proven and Sarah was given 2 months hard labour. Again in May of 1867 and Samuel was robbed of 1s from the till by a 10 year old lad named David Slater. Young David was described as a “miserable looking little fellow, who was well whipped about 2 months ago for petty larceny”. Samuel had premises then on South Street. Scoundrel David was searched and the shilling was found in the lining of his cap. David pleaded guilty and the Bench were told how he was the “victim of lazy parents”. David was sentenced to one months imprisonment with hard labour and then to be sent to a reformatory school for five years. There are numerous cases of theft from Samuel; he must have tired of the situation. Samuel married Mary Ann / Marian Bollington in 1862. 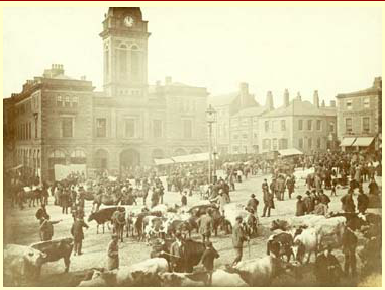 In July of 1869 Samuel moved his butchers to the Market Place. In 1871 Samuel and his family live on the High Street and Samuel is practising his trade as pork butcher. Samuel moves around the town centre over the next 20 years, presumably as his business grew then he would move to new premises. In 1891 he has decided to try his hand in the hospitality business and as well as being a pork butcher Samuel is hotel proprietor at the Star Inn on the High Street. This venture looks fairly short lived as by 1901 Samuel has yet again changed his working life and is now living at Birdholme and alongside the pork butchery he is a farmer. Moving on to 1911 and it seems Samuel has grown too old for change; he is back in the town centre, living at 88 Saltergate once again solely a pork butcher. Samuel died on 24th April 1926. His will gained probate on 21st August 1926. He left his estate to Walter Hadfield (pork butcher) and Frank William Stanton (accountant). He left a grand sum of £19256 13s 8d which in today’s value is around £577,122.80 – so it seems that Samuel was indeed a “Master” pork butcher, who with the help of his wonderful tomato sausages lived to accrue quite a sum of money. What was news in the local news this weekend in 1887? There were a few Irish Geese also on sale ranging in price from 3s 6d to 4s. Alfred Chapman and Joseph Salt of Barlow were both in court for offences against the school bye laws. The Chesterfield Board of Guardians was prosecuting. Alfred Chapman a farm labourer had a 10 year old son named Fred. Fred had only attended 122 out of a possible 241 lessons. Alfred was fined 3s. Joseph Salt was fined 2s 6d for allowing his daughter (unnamed) to only attend 79 out of 241 possible attendances. Joseph’s wife also attended court and produced a doctor’s certificate for the last two weeks, stating that their daughter had been too ill to attend school. Harriett Hodkin and Mary Redfern were summoned for threatening Angelina Taylor. Mary Redfern in particular had threatened to “scald her ***** eyes out and split her head open with a “paunch””. Angelina of Barlborough stated that the pair had been threatening her for the past 6 months. The court chose to be lenient and agreed the defendants be allowed to settle the matter by paying the court costs. Poor Angelina who had feared that Hodkin and Redfern would cause her bodily harm was left, to see what would now happen between the three ladies. The previous week had seen very wintry conditions. Keen frosts and winds had prevailed. The year had on a whole been a dry one and many areas were suffering from water shortages. The out-look was for rain on Thursday and becoming warmer for a time. S Hadfield of the Market Place, Chesterfield was advertising his sausages. He boasted that “everyone should try them”. Maybe it was S Hadfield who developed Derbyshire’s love of the tomato sausage. *William Horner a carpenter to Elizabeth Ellson daughter of Charles Ellson of Butterley Hill on 23rd October at the Baptist Chapel, Swanwick. *John Beach to Jane Jackson of Matlock Bath on 25th October at the Derwent Terrace, Matlock Bath. *Joseph Charles Jones to Ellen Hutchison at the Ebenezer Chapel, Ripley on 20th October. *Ann Wardle of Scotholme, Nottingham previously of Chesterfield aged 72 years on 19th October. *Annie Elizabeth Boden aged 6 yrs 6 months died on 25th October. Annie was the daughter of W.F and R J Taylor of Burlington Street, Chesterfield. *Job Weet of Duke Street, New Whittington on 23rd October aged 76 years. *Joseph Robinson at Holywell Street on 23rd October aged 89 years. *Emily Boulton-Ward at Queen Street, New Whittington aged 16 months on 22nd October. Spital Olympic met Grassmoor football team at the Spital ground. Olympic won the toss and kicked off with their back to the entrance of the pitch. During the first half the home team Olympics’ lived up to their name and were winning with one goal to show. The second half was a much faster game and the Grassmoor team did try, but the Olympic team gained one more goal. Worthy of a mention for their good game was, Elliott in goal for the Grassmoor team and Hancock, Baber, Peach and Burton for the Spital Olympic team. Fancy a trip to Gibraltar? The Orient Steamer Ormuz was in the news for the fastest trip to Gibraltar from England. The streamer left Plymouth on Saturday 15th October at 12.50 mid-day on a journey to Australia. It passed Gibraltar on Tuesday 18th October at 5am. The time taken was the shortest time on record – 64 hours and 10 minutes. The five men were awaiting trial at the March Assize Courts in Derby when we last heard of them. What was the outcome of the trial? The five stood trial early on 20th December 1859. They were described as “rough looking fellows” in the Derby Mercury. The men were Thomas Hoult (sic) 22, William Hoult (sic) 25, Anthony Coates 20, James Todd 25 and Thomas Moody 26. Mr Stephen defended all the men bar James Todd, he stated that he had “never seen such a disproportion of means to and end as was disclosed in this case, in which a gang of five Chesterfield burglars and six Policemen were engaged in stealing and in recovering a book and some artificial fruit!”. He went on to add that none of the five men could read and so the book was of no use to them. As for the artificial fruit; well he could come up with no explanation as to why they would place the fruit in the privy. With these statements he concluded that the items must have been stolen by other persons, and he would leave Todd to explain where he got the book from. Todd’s answer – if had stolen the book he would not have waited for the Police to catch up with him. The four other men received good character references from Mr Robinson a surgeon of Brimington and Mr Redshaw a miner. Thomas and William Hoult, Anthony Coates and Thomas Moody were given 6 months gaol with hard labour. As for James Todd, as he had a previous conviction he was sentenced to 15 months hard labour. The registers for the trial also confirm that the men received the sentences for burglary and that James Todd previous conviction was taken into account also. James Todd had stood trial at the beginning of the year on 4th January 1859. He was convicted for 6 months for “larceny on the person”. He appeared at the Quarter Sessions charged with stealing £2 10s from James Revill of Chesterfield. The poor man who was burgled by the “rough looking men” – well he appeared again in the newspapers a few months later, when he announced his marriage to Mrs Hannah Boot of Cavendish Street. The couple tied the knot on 2nd July 1860 at the Elder Yard Chapel. The 1861 census shows William aged 60 and Hannah aged 57 living at Saltergate. William employe's 2 men and his son, 19 year old Richard is an apprentice slater. Prior to marrying Hannah, William had been married to Ruth but sadly she had passed away in 1858. The couple married at the St Mary & All Saints parish church in Chesterfield town centre on 6th August 1826. Ruth’s maiden name was Varley. Their witnesses were Richard Watson and Hannah Varley. William died on 23rd February 1869. He left a will which was proved at Derby on 25th May that year. He named George Short a currier and Charles Rollinson a joiner as executors. His effects were under £200. What was news in the local news this weekend in 1859? Five men appeared for trial at the Municipal Hall in Chesterfield on Friday 21st October. They were charged with robbing Mr William Watson’s home a slater who lived on Saltergate. On the night of Friday 14th October William Watson had retired from his parlour to bed around 23.45. As the shutters to his parlour window would not lock he had ensured that the outer windows were locked and secure. An hour later he was awoken by two Policemen – P.C Wilcockson and Sergeant Vincent to alert him that he had been broken in to and to show him two items which the Police thought belonged to William. William confirmed that the “shade of artificial fruit and a book entitled The Life Of Christ” were his property and that they had been on a stand by the window at the time that William had retired to bed. Earlier that night, Inspector Gulley had thrown the five men out of the Old Wheat Sheaf public house and watched them walk away, up Saltergate towards Mr Watson’s home. At this point Sergeant Thomas Vincent had followed the men “up to Mr Ford’s, at the Uncle Tom’s Cabin they then crossed over the road to Samuel Spooner’s, the Yellow Lion beer house and went into the back yard”. Sergeant Vincent had approached the men and asked them what they were doing in the yard, to which they replied that they wanted some more beer. They were told to move on as the beer house was closed and Sergeant Vincent watched four of the men return back down Saltergate, the fifth man Thomas Moody stayed leaning on the wall outside the Yellow Lion. Sergeant Vincent then walked away to meet his comrade P.C Browitt at the house of Mr Booth the timber merchant and told him of the party in Saltergate. When the two police officers returned to the Yellow Lion they found the five men back in Spooner’s yard. James Todd was the last to enter the yard and when he did so Sergeant Vincent noticed that he had something hidden in his coat. On asking what the object was James Todd ran off up Union Walk. A police chase ensued and James threw a book at them. Unfortunately the Police then lost the man in the chase. They returned to the yard and found the shade of artificial fruit hidden in the privy. The window of William Watson was found to be open and the items removed. The Police believed that another two men were also involved – Samuel Turner and a nail maker. Next morning at 7.30am the Police found James Todd at his home on Silk Mill Yard. He denied any involvement in the robbery. All five men were committed to take their trial’s at the next March Assize Court. George Wilson a colliery steward admitted assaulting Philip Sherry but said he had been provoked. The incident occurred at the Hasland Lane Colliery and George stated that he had hit Philip Sherry after he had witnessed him striking a young lad at the pit. George said that Philip was regularly hitting the lad. This was not enough of an excuse for the Magistrates and George was ordered to pay a fine of 10s along with costs of 15s 6d. Two young lads; Charles Glossop and William Wrigley both aged 15 years old were charged with stealing a pigeon worth 3s 6d which belonged to Edward Haslam. Charles Glossop was sentenced to one month’s hard labour and William Wrigley was discharged with a caution. It was also noted that William had been involved in several other suspicious circumstances. A colliery worker named Thomas Kelly was given the choice of either returning to work for two weeks and pay the expenses of 8s 6d or go to gaol at Derby for 21 days after he had left his job without giving proper notice. Thomas Kelly had been involved in a dispute over wages and the issue had been deferred to the Steward, who had told them to return to work and he would put their case forward. All the men had returned other than Thomas. In light of his choices Thomas chose to return to work for two weeks rather than be imprisoned in Derby Gaol. A Chesterfield Post Office clerk accused Thomas Taylor a labourer of knocking off his hat as he passed him in a public street, The incident occurred at the top of the Market Place when Thomas Taylor had knocked clerk Mark Joel’s hat from his head into the road. Thomas had not said a word but simply knocked the hat off Mark Joel’s head. The Police were called and Thomas was said to have been drunk, he was fined 10s plus costs. *Mr Francis Whitworth of Sheffield to Miss Elizabeth Spray, youngest daughter of Mr John Spray, wheelwright of Palterton on 23rd October at Bolsover. *Elizabeth Barber wife of Thomas aged 29 years. *Robert Jones aged 50 years of Walton. 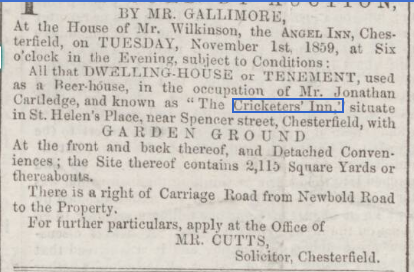 The Cricketer’s Inn which was situated at St Helen’s Place near Spencer Street was to be sold by auction. The property was in the use of beer-house by Mr Jonathan Cartledge. The property consisted of a dwelling house, gardens at the front and the back and was around 2115 square yards. There was a road to the property from Newbold Road. An unnamed man from Whittington was the topic of ridicule this week, after his altercation with the image of another man in his bed room. The man had retired to bed and was soon asleep. During the middle of the night he awoke and raised his arm to view his watch. At this point he saw the form of a man at the bottom of his bed. After a moments staring at the apparition, the man leapt from his bed and chased the “man” around the room. Armed with a poker he ran downstairs, still unable to catch the “man”. At this lack of success he alerted the neighbours, who all attempted to find the intruder. It wasn’t until one of the neighbours noticed the man swiping his poker at his own shadow that the mystery was solved. The Whittington man was chasing his own shadow. It was a moonlit night and the shadow of the poor scared man was following him around the room. At this conclusion the man was said to have “found out his error…. He very quietly went to bed to dream of his foolishness”. Unfortunately for us the name of the man is not recorded in the report. One a few years later in June of 1882 when a youth named John Walker, a labourer of Spital was accused of throwing stones at a young lad named Henry Baskill. Henry’s mother had complained to Superintendent Carline when, as her son looked over a wall at John Walker, he was struck by a large stone in the chest. John said he was clearing clay away from the footpath and the incident was no more than an accident. Being the local officer Superintendent Carline knew John and his family and told the courts how John and his brother were being complained about every week by the local residents. He said they damaged hedges, walls and garden produce. Taking this into account John was found guilty and fined 11s 6d including costs. Two years on and in May of 1884 John was again in trouble for poaching at Spital. P.C Brenchley had been watching land at Spital on Sunday 20th April when he saw John and two other youths; Henry Miles and Samuel Cooper and a dog go along Spital Lane into Hady Wood. Once in the wood the lads took a stick out and started beating the hedge for game, skirting around the edge of wood as they went. They also laid snares. P.C Brenchley was observed by the poachers and they lay on the ground, Samuel Cooper covered the dog with his coat to try to avoid detection. P.C Brenchley had already spotted them and asked what they were doing there. John Walker replied that they had permission from Mr Jeudwine. On emptying their pockets more snares were found. The three defendants all pleaded not guilty and even the dog stood trial – he was seen to be “a most harmless character”. As John had been previously convicted he was fined £1 plus costs, but Samuel and Henry were said to have excellent characters from their employees and the charges against them were withdrawn. Inspector Handley was mentioned in the news after arresting George Fox for riding without reigns in Clay Cross in October 1876. His full name was William Handley and he was born at Moira, Ashby De La Zouch, Leicestershire around the end of 1840 – beginning of 1841. His parents were John and Ann Handley. John was originally from Stretton, Derbyshire and worked as an engineer / engine wright. William started out on his career as a Police Officer at a young age; by 1861 aged 20 he is living at Derby and is on the first rung of the ladder as a Police Constable. The first mention we find of William at work is in May 1863 when he arrested Thomas Millers at Marsden Moor, Staveley for begging. Thomas was gaoled for one month for vagrancy. By 1871 William has been promoted to Sergeant, he is 30 years old and back living in Leicestershire at the Odd Fellows New Constabulary, Ashby De La Zouch. His wife Emma and a daughter are residing with him and just one prisoner is in the cells that night; George Fisher a 25 year old railway labourer. All of the men were coal miners. In July of 1887 William has put all his possessions up for sale. His reason for sale is recorded; that he is leaving the area, however in 1891 William has not moved far – he is no longer a Police Officer but is now the publican at the Prince of Wales Inn on Thanet Street in Clay Cross. His goods for sale in 1887 include a case with a stuffed dog, family bible, pictorial atlas of the world, 4 feather beds, 3 time pieces, numerous mahogany pieces of furniture, cane furniture, 4 wash-stands, 4 feather beds, 2 iron French bedsteads. William seems to have acquired a good standard of living from his career in the Police force. William died on 20th June 1894. He was still working as an Inn Keeper at Clay Cross. His estate went to probate on 31st July that year. He left £242 8s 9d to his widow Emma and Robert Longmate a butcher. His death was announced in the Derbyshire Times of 23rd June 1894 stating that he was 53 years old and for many years had been a member of the Derbyshire Constabulary. He was interred at Clay Cross on Sunday 24th June 1894. What was news in the local news this weekend in 1876? A lad named Luke Bennison aged 16 years old was the victim in this tragic accident which occurred on the 27th September. Luke was not killed outright but suffered sadly until Monday 9th October before he passed away, after receiving medical care by Mr Hale the surgeon. The inquest was held at the Barrow Hill Hotel the next day and the coroner heard how Luke and some friends had been playing with gun powder at a slack heap, near to Barrow Hill. They had placed some powder in holes in the ground and had then ignited them. On this instance a spark reached the pocket of Luke where he had carried the powder, causing the remaining powder to explode. Luke was the son of a collier also named Luke and he identified the body. His clothes had been burnt off and he was burnt from the knees to the chest. A witness, Robert Vardy a pony driver of Barrow Hill had been with Luke on that evening around 6pm, after work. He said that Luke had his trouser pocket full of gun powder and that when he had been lighting a fuse some of the gun powder had become wet and stuck to his hands. The fuse lit before he was ready and the spark flew into his pocket, the powder in his pocket exploded. The cousin of Robert Vardy a man named John Vardy also a pony driver of Barrow Hill was also called as a witness and repeated the sequence of events as his cousin had outlined. A young boy named John Walker was accused of damaging a bucket belonging to John Cargill. John Cargill stated that it wasn’t just the damage to the bucket, but the fact that the young boy had trespassed on his land and had also been insolent in his behaviour towards him. The young boy, John Walker did not deny damaging the bucket, but alleged that is was done accidentally whilst playing with his friends. He was fined 1s and ordered to pay 6d for the damage done and the cost of the summons. George Hill a collier from Bolsover was charged with illegally trespassing on the land of Thomas Nisbet on 26th September. This was not the first time George had been found trespassing on this land, but the 25th time. He was caught shooting a partridge on the land without a licence to do so. PC Poyser was out that night and watched George beat the field with his dog and gun. When the partridges were disturbed he shot one of them. Not surprisingly, as this was Georges’ 25th time of being charged, he did not attend the court hearing. In his absence he was fined £2 and costs for trespass and £2 10s for illegally shooting game. John Perry had only been employed by the Derbyshire Constabulary for the past six weeks when he found himself in bother. On receiving his wages that day he had got drunk with the money. He was on duty at the Litchurch Lock-Up at the time. On returning from his drinking binge he broke the window of the lock-up and once inside also damaged the table and the bed. He was said to have tried to fight the other two constables on duty that day. John was fined 40s and costs or one month’s imprisonment and was also ordered to forfeit the six week’s pay he was due. George Fox was summoned to Clay Cross Petty Sessions after Inspector Handley saw him riding on a conveyance without reigns on the 6th October. He was also charged with not having proper control over the horses. George was fined 10s and costs of 9s 6d. *Mr J Booth, grocer to Mary Elizabeth Rains of Tyrell Hay, Radbourn on 10th October at Bolsover Parish Church. *John Knowles to Alice Plant on 5th October at Eckington Church. *Mary A Jameson aged 1 year and 9 months at Hasland. The Quidnunc Cricket Club commemorated the closure of another season by taking a super at the Rose and Crown in Eckington. The club had played 14 matches that season and won 6, lost 4 and drawn 4. The highest average batting was attained by Henry Slater.